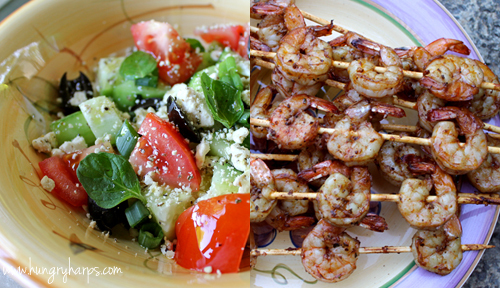 I love food holidays, so when I heard that May was Mediterranean Food Month - I knew we had to celebrate! An ice cream party may seem a little unconventional for this holiday, I understand that. The Mediterranean diet screams HEALTHY - so I must have lost my mind throwing an ice cream party to celebrate such a wholesome diet. Well, maybe I have - but the flavors of the Mediterranean just seemed perfect for an ice cream party. 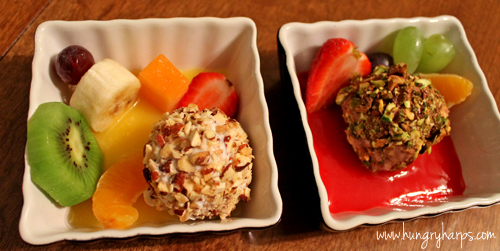 Toppings such as nuts, fruit, honey and mint sounded unique and delicious, so the planning began... and the idea of Nut-Crusted Ice Cream Balls with Fresh Fruit Kabobs and Dipping Sauces was created! We headed to Smart & Final to pick up the supplies needed for a Mediterranean Ice Cream Party. 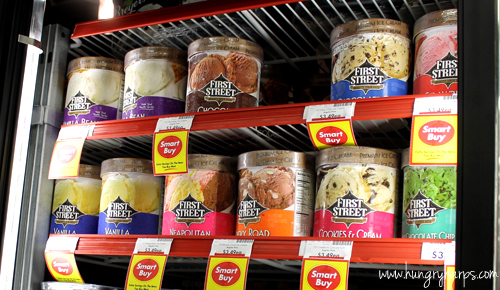 (Check out our shopping trip here) I am a huge fan of First Street Ice Cream - main reason being, it is made from Real California Milk. This is important to me, real important. You can read more about Real California Milk at the CMAB website here. There is some really good information on their site including the California standards for how dairy animals are treated to special coupons/deals for Californians. 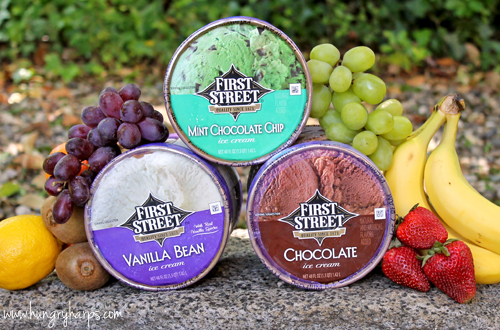 Our local Smart & Final had a nice selection of First Street Ice Cream flavors; Vanilla Bean, Chocolate, Chocolate Chip, Strawberry, Vanilla, Neapolitan, Rocky Road, Cookies & Cream and Mint Chocolate Chip. In case those flavors don't suit your fancy, they also carry Chocolate Chip Cookie Dough, Butter Pecan and Moose Tracks (one of my favorites!). We bought the 48oz containers, but First Street also carries 3gallon and 5qt sizes, perfect for large parties. Besides Ice Cream First Street also makes Sherbet, Fudge Bars, Sundae Cups, Ice Cream Cups, Ice Cream Sandwiches and Super Pops. We ended up getting 3 flavors - Vanilla Bean, Mint Chocolate Chip and Chocolate. Yum! Alright, enough gabbing about how great Smart & Final and First Street Ice Cream are, let's get to those Nut-Crusted Ice Cream Balls! 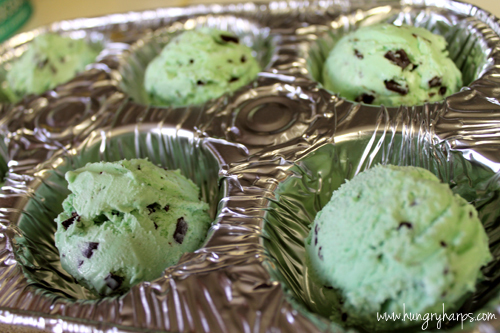 First, I scoop ice cream balls and place them into muffin pans. I have tried doing this on baking sheets before, but the ice cream balls ended up getting stuck together - and that is not what we want. 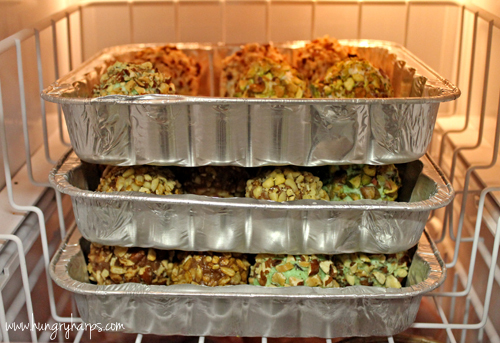 Next, the ice cream balls go into the freezer for about 30 minutes. This is a good time to get all of your nuts ready! 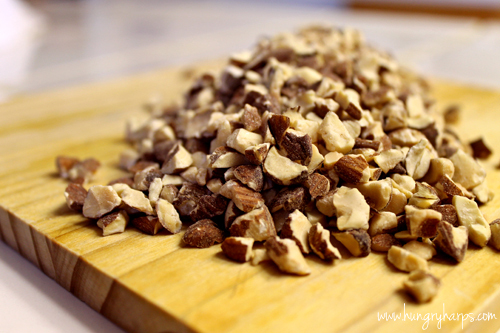 I use chopped nuts and spread them out on a cutting board. 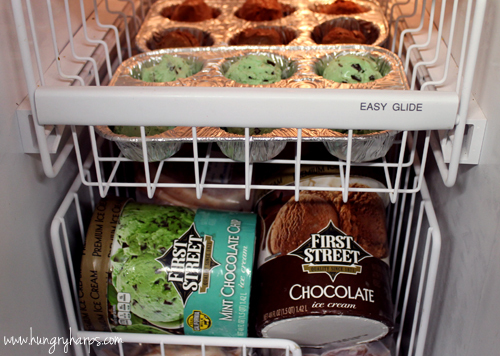 Then it's back in the freezer - this time for at least an hour to make sure the nuts get set into the ice cream. 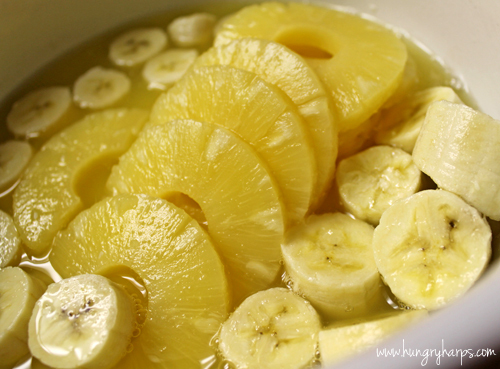 The secret to keeping the bananas from turning brown was soaking them in the pineapple juices for 5 minutes before assembling the kabobs. 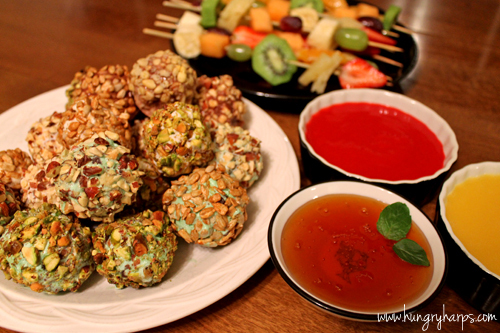 I also prepared two sauces to be served with the Nut-Crusted Ice Cream Balls - don't worry, they are not ketchup and mustard! 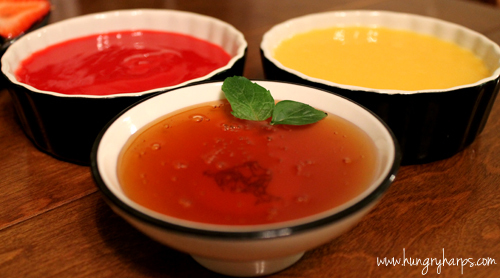 They are Raspberry Sauce and Lemon-Orange Sauce - both from scratch. :) Honey is also popular in the Mediterranean, so we made sure to include it as well. 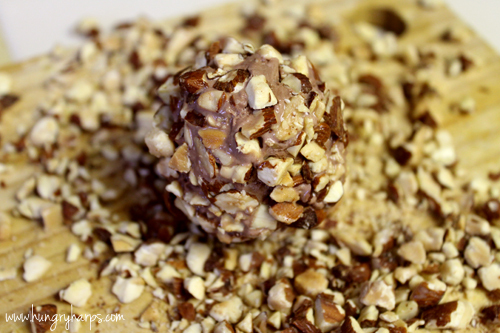 A little after an hour, our Nut-Crusted Ice Cream were ready to be devoured eaten. Aren't they pretty? To redeem myself, if just a little bit - our main course consisted of a Mediterranean Salad and Red-Wine Marinated Shrimp. Smart & Final has a line of Mediterranean products, La Romanella, which helped me create these two dishes. Enjoy! Absolutely awesome!! 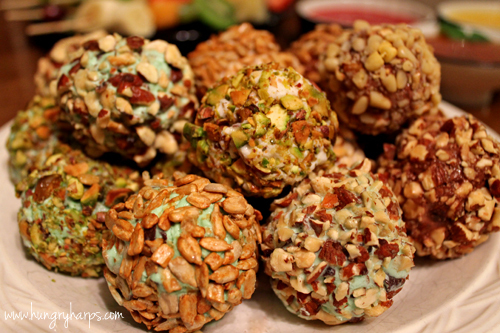 I love it all...especially those Nut Crusted Ice Cream Balls! This looks really delicious, love that it is different from a traditional ice cream party! 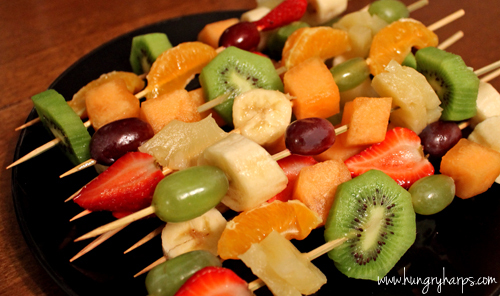 I am soooooo making these! Yum. These look totally stunning. Lovely photos. Um, how fun is that?!?!? I'm jealous! This is such a great idea for a dessert. I have to try this! Holy yummy! I am so glad you linked this post up on Successful Saturdays! this ALL looks fabulous! ICE CREAM PARTY?! Hold on, I think I'm having a heart attack...this is just too good to be true! Just looking at those pictures makes me drool. Amazing. I wish this was my birthday party. Thanks for sharing!